Continuing our study of the divisions of the Major Arcana brings us to the next three cards- here, the Empress, the Emperor, and the Hierophant. 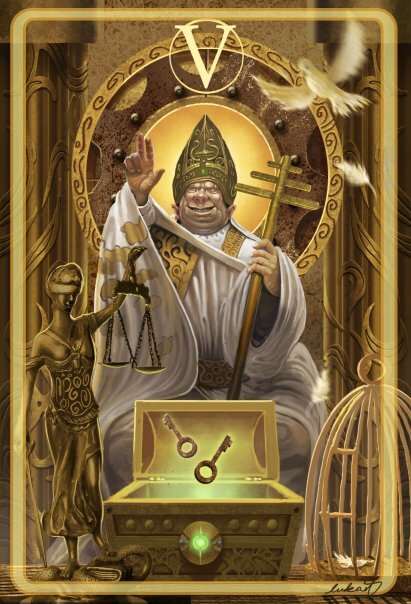 Having found his own personal sources of power, the Fool comes to understand a little more of the world around him, and these three cards represent his relationship to the world around him, and more importantly, his operation in that world. First, the Fool encounters the principle of the Empress- she represents growth and expansion, and the support of that growth. Often shown both seated and sometimes noticeably pregnant, this indicates first, her passive nature, not unlike the High Priestess. She is tied to the earth, indicating that she supports and promotes growth, and is the fertile ground to grow in, symbolically speaking. The Fool exists in the world, and is dependent upon it for his existence. Think of it as the raw material with which the Fool can shape whatever he desires, like clay. The clay is passive, it doesn't take on its own shape, but takes on the shape the Fool, acting upon it, imposes according to his own designs. The clay is there to be shaped and created. 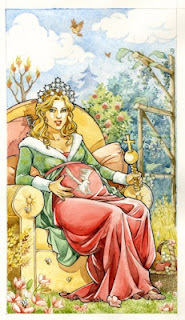 The Empress often appears pregnant as a sign of her potential- to be shaped and to give rise to whatever the Fool may decide, as he manipulates the world in the manner of the Magician, utilizing skill and knowledge to produce a desired end result. To see the Empress in a reading is to find that the world is waiting for you to act upon it, to impose will and turn potential into reality. However, the Fool also learns that simply growth on its own is not enough. Simply growing for the sake of growth leads to randomness, disorder and chaotic growth. Clearly, growth needs to be given shape and structure, and we understand both shape and structure not in terms of what is there, but rather in terms of what is not. This brings us to the opposite principle, the Emperor. The Emperor represents structure in terms of restriction and form; the Fool does not operate in a void, rather there are laws and rules imposed upon this raw material by the world around him. The laws of physics, gravity and mathematics all give structure and shape to our world; things operate according to an organized pattern, instead of simply descending into chaos. When we throw a stone in the air, we can be reasonably sure it will, sooner or later, fall back to the earth. Is this a restriction on us, or is it something we can use? Although it does prevent some possibilities from happening, thus limiting us, it allows us to understand the nature of the world. The two principles work together- we have growth, and also structure to that growth. Imagine a plant that did not have structure- it would not be able to survive, it would just grow randomly and all over the place, instead of ordering itself in terms of flowers, stems and leaves- the very things it needs to insure its continued survival. In other words, we have a duality- both principles are needed, both the freedom to expand and the discipline to expand along the right channels. When we have an excess of either, it's for the worse. Unchecked growth can lead to destruction, as can unchecked restriction. Our hypothetical plant can either be suffocated under its own freedom of expansion, or be so restricted that it withers and dies. Now, when the Fool looks at these two principles, he sees the order of the world around him, and it was from this order, perhaps, that man first developed his belief systems about the world. Trial and error, and accumulated knowledge, meant that the earliest men and women did not need to 'reinvent the wheel'. We see this even today, with new technologies and innovations building on what has come before. Imagine if someone were to design a new computer- would they need to start from absolute square one, re-discovering Babbage's differential engine? Of course not. Rather, they would build on what has come before- we already have computers (the fact that you're reading this is evidence of that, ha ha), so the next step is to build off of that. Keep what works, improve what can be improved, and scrap what no longer serves that end. The same is true of philosophy and mysticism; John of Salisbury put it best when he likened us to dwarves standing on the shoulders of giants- indeed, the dwarf sees the farther of the two. This brings us to the Hierophant- the Fool has the ability to develop a belief system and philosophy based on past experience. 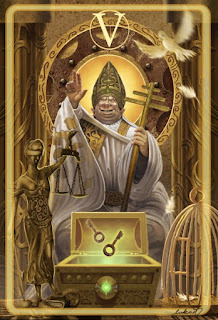 Whereas the Empress and Emperor represent the development of this system, the Hierophant shows that system incorporated into a formalized belief system. Every day we operate within a belief system, be it driving a car or social interaction. We can make assumptions in both cases about the other person's actions before those actions occur. Why? Because we have a system, more or less based on observation, of what is most likely to happen. When I go to the store to pick up a jug of milk, will the cashier ask for barter? Say, a dozen eggs from my farm in exchange for a gallon of milk? While in some parts of the world this is true, the same principle applies- a commonly accepted system of interaction. So we could say that the principles of expansion and restriction form the basis of any system of belief. For every action, one could say, a reaction exists. Again, the Hierophant tells of a need for balance- when there is no organized system, law goes out the window, and chaos reigns. However, this system also needs to be able to incorporate changing factors, and not remain entirely static. Yes, we can see that there are universal and unchanging principles, however as our ideas and realizations about the universe change, so must our systems of philosophy. 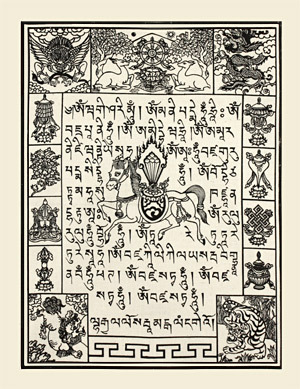 The Dalai Lama once said that if aspects of Buddhism can be found to be false, then Buddhism itself must change with new information. So at this point, our Fool has discovered a great deal about himself and his place in the world- how he can act upon the world, and how in turn the world can respond to change.